Letterkenny made it 3 from 3 in 2019 when they welcomed Belfast Highscool Former Pupils to the Glebe yesterday. On a cold but generally dry day, BHSFP kicked off to the home team who set their stall out early with some carries from their pack. Hard yards were made by the Letterkenny tight five as Christopher Digimas and Cormac McMenanimin looked to set the tone early. BHSFP stood up well to the challenge though and both teams remained equal for the opening minutes. Letterkenny managed to strike first with the games opening try on 15 minutes when Dave Brown found the try line through a sublime pass from scrum half Liam Fogarty. McGinley was unable to convert as the ball just drifted slightly wide. Letterkenny 5-0 BHSFP. The visitors were quick to stamp out Letterkenny’s early score when their scrum half was first to pounce on an overthrow from the line out inside the halfway. Finding a gap in the defence he was left one on one with the Letterkenny fullback but showed dazzling feet to step around him and score. Again this was unconverted leaving the teams level after 20 minutes. For the remainder of the half, BHSFP fought hard to stay in it and were able to convert their pressure in to some good field positions as Letterkenny went off their feet at the ruck time and time again. With the half drawing to a close BHSFP looked set to level up the score when James Lee McLaughlin found himself with the ball and breaking out of his own 22. The visitors scrambled well but some slick handling from the backs saw Brian McGinley finish well in the corner, bringing the half to a close. Letterkenny 17-5 BHSFP. The opening ten minutes of the second half proved to be a tight contest once again as the visitors refused to lay down. With the penalty count once more in their favour they were able to find the half’s opening try when their fullback broke to the right of a scrum and found the whitewash leaving an easy conversion for the flyhalf who slipped upon converting the try. Letterkenny 17-12 BHSFP. 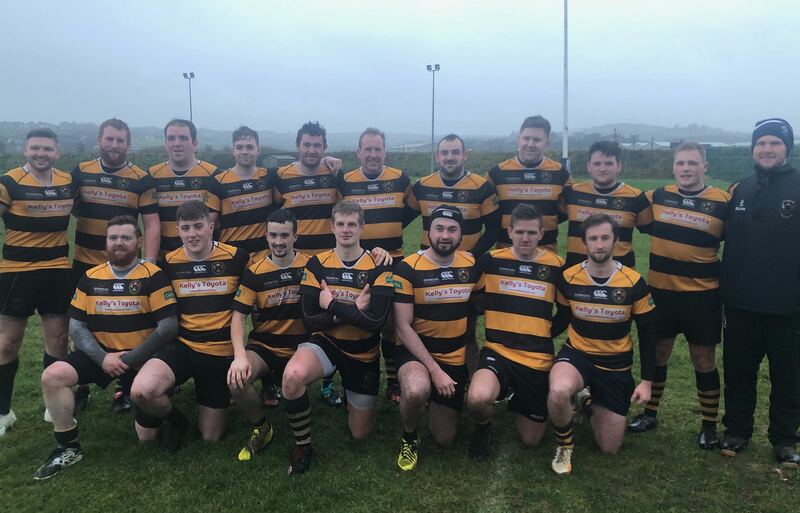 Feeling like they had more in the tank, Letterkenny once again went in search of a response and they found it through second row Ciara Clarke. Following a strong latch from his second row partner McMenamin, Clarke broke through the Belfast defence and rounded the fullback to score Letterkenny’s fourth try of the day. McGinley making no mistake with the extras. Letterkenny 24-12 BHSFP. Shortly after, the game saw a long stoppage for an injury to McMenamin who sadly limped off with what looked to be serious knee injury. The versatile and often abrasive forward will be a big loss for the team and the club would like to wish him a speedy recovery. This paved the way for the miracle return of Sean Morris who had seemingly forgotten the definition of a maul following a long lay off as he looked to educate the referee upon his arrival. The game restarted with a scrum which was dominated by the home team, allowing Dave Brown to pick at the base and pass to scrum half Fogarty. He found McGinley who managaed to put McLaughlin away in the corner for Letterkenny’s 5th of the day and a deserved five pointer for young James Lee following the exploits of older brother Kevin after last weeks heroics. As the clock ticked towards 80, BHSFP sneaked in for a consolation try to leave the final score at 29-17. Letterkenny make it 4 from their last 4 as they prepare to travel to Cavan next week for another league game. Letterkenny’s next home game comes on the 9th of Feb when they face Newry at the Glebe in what will be their final league game before their Cup Quarter Final away to Hollywood.